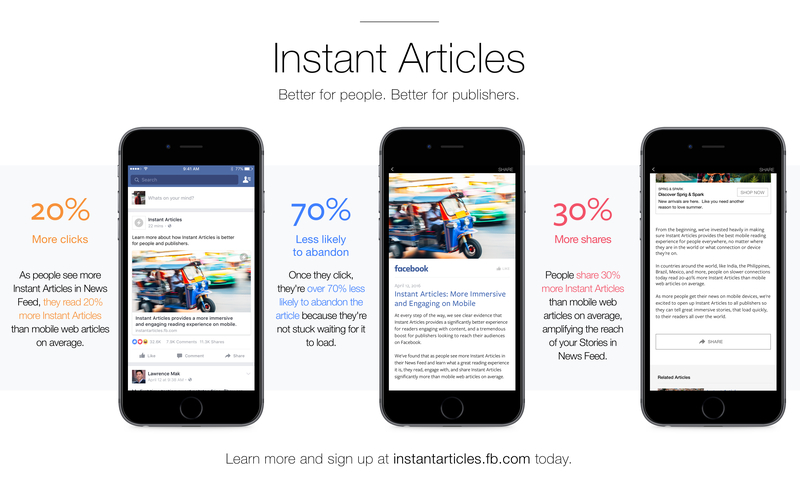 As previously announced, Facebook today opened its Instant Articles format to all developers. Using Instant Articles, publishers can show Facebook mobile users a fast-loading and mostly distraction-free view of their posts while still also showing them a limited amount of their own ads (or use Facebook’s Audience Network to monetize their content) and measure pageviews through tools like Adobe Analytics, Chartbeat, comScore and others. Until now, Instant Articles was only available to a select number of publishers. Like Google’s AMP, an Instant Article is essentially an HTML5 document that uses a couple of specific tags. Publishers can add text and images, but also slideshows, audio captions, maps, video and — of course — support for Facebook likes and comments. There are already some plug-ins for WordPress and other CMS systems like Drupal available today that will generate the right Instant Articles feed automatically. Publishers will now also be able to publish native ads as Instant Articles, as well, and visually distinguish them from their regular content by applying different styling options and adding a sponsor logo to them. For publishers who want to delve even deeper into working with Instant Articles, ShareThis today announced that it now offers A/B testing for Instant Articles headlines.